Over the last couple of years, public anger against Amazon and Jeff Bezos has intensified. In Seattle, this most clearly manifested itself in the uproar that followed Amazon pressuring the Democratic members of the city council to repeal the modest tax on the largest corporations in the city passed last year. Residents were furious that one of the richest corporations in the history of the world refused to pay even a very small share toward helping resolve the homelessness crisis in Seattle. And once again, Amazon paid no federal taxes for 2018. In New York, activists were recently able to build a successful fight back against the planned “HQ2” and $3 billion subsidy that Andrew Cuomo and Bill de Blasio wanted to give Amazon. Those plans have now been canceled. In Minneapolis and in Europe, small groups of Amazon workers organized and were able to successfully force Amazon to the bargaining table over a handful of issues. Now, a new group of workers within Amazon are trying to build a fight back of their own. The Momazonians are a group of 1,800 mothers working at Amazon who have started to organize against the family-unfriendly working conditions. Tech companies in general have an incredibly poor reputation when it comes to “work-life balance” and helping working parents, but Amazon is particularly egregious. 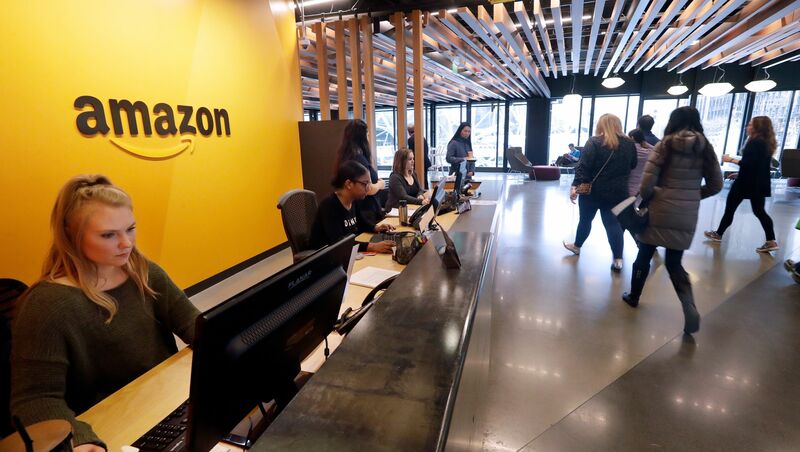 According to workers at Amazon, they are expected to work long hours, and many have seen themselves marginalized and their careers derailed when they have children. Many parents at Amazon say they feel like they must hide the fact that they have children, because they fear being sidelined and ignored by their bosses. For the time being, the Momazonians have decided to focus their efforts on fighting for one key demand: employer-provided daycare. This would allow working parents to access onsite daycare or at-home child care for sick children. The costs of child care are a general issue that seriously affects all working-class families and a broader fight is needed. So far the Momazonian’s strategy has been limited to lobbying management for a meeting to discuss the daycare proposal. To truly become a force that pushes for change within the company, the Momazonians should take their campaign public to bring the abuses of Amazon out into the open. The only way to win serious gains at Amazon and protect people who demand improvements from company retaliation is to unionize the whole workforce. If the Momazonians could link up other Amazon workers – tech workers and “fulfillment center” warehouse workers – they could form a powerful coalition to fight for the rights and working conditions of all Amazon employees. The potential power of all these workers to disrupt Amazon’s operations through various types of work actions would force management to the bargaining table. Workers from all walks of life have to deal with a system which subordinates the needs of working-class parents and their children to the demand for more profit for the ruling class. An Amazon-wide union would be a huge step forward. It could join up with other unions and working people across industries to fight for the reforms we desperately need, including universal child care and mandatory paid parental leave for all workers in America.